Where is Corporate Helicopters located? When should I arrive for my helicopter tour? We recommend arriving 15 minutes before your schedule tour. This allows enough time for us to check in and pre-flight all passengers regarding safety issues and procedures when in the helicopter. What is the best time to take a helicopter tour? Do you have a set helicopter tour schedule? No, we do not have a set schedule. Tours are established solely by request. We will fly any of our tours at anytime, weather permitting. We suggest you book (reserve) your flight in advance to ensure availability. All of our tours offer an excellent view, and any flight time in the late morning or early afternoon should be fantastic, weather permitting. We are open 7 days a week and will do our best to accommodate the needs of our clients. Customers always come first. Will other passengers be on my helicopter tour? Yes. We reserve the right to fill all seats in our helicopters, so you may be paired with others. If you would like a tour that is guaranteed to be private: please email us or call (858) 505-5650. How experienced are your helicopter pilots? Corporate Helicopters is proud to provide our passengers with some of the most experienced pilots in San Diego. Each of our pilots has received extensive company and factory training to ensure the highest level of safety on each and every flight. How many passengers can fly in a helicopter? In our fleet, we have helicopters capable of accommodating from 3 to 6 passengers. We are also capable of flying multiple helicopters for groups larger than 6. However, each helicopter does have a maximum weight limit and an individual seat limit. If either of these limits are exceeded, you will need to upgrade to a larger helicopter or decrease the size of your party to ensure all safety requirements are met. Do you have helicopter tours for groups, or custom helicopter tours? We can create a custom tour to accommodate large groups by flying multiple helicopters. In the past we have flown group tours 50+ passengers, and we are capable of accommodating even more. Additionally, tour routes and durations can be customized to include specific locations of interest. 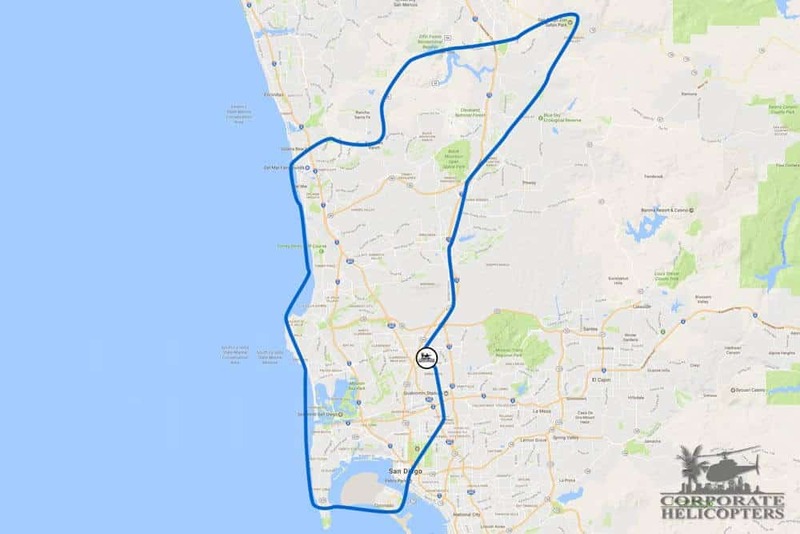 Can a helicopter tour route be modified to see your house or other special location? Our tours are routed to offer the most breathtaking sites within the allotted time period. 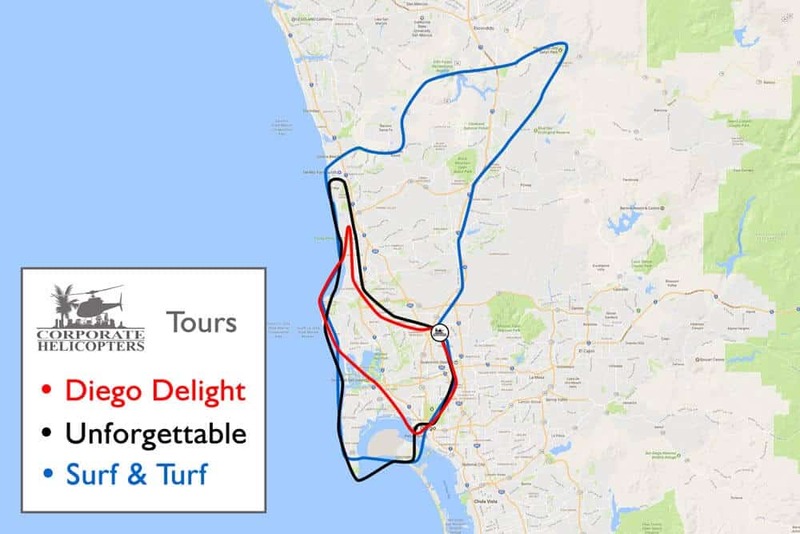 However, if there is a specific location you would like to see, we are capable of adjusting the hour long Surf & Turf tour to include your desired location assuming no extra flight time is incurred. Our main goal is to provide each customer with the most memorable experience possible. Can I take pictures on my helicopter tour? One of the most important things to remember to bring on your helicopter tour is your camera. During our tours, you will be able to shoot through the glass of your helicopter and capture some amazing shots of San Diego. If you happen to be a professional photographer: We offer aerial photo flights for professionals looking to capture the beauty of San Diego from above. For these flights, we remove the doors and create a customized route to include all of the specific locations you wish to shoot. Contact us for more information. How do helicopter charter flights work? We are an FAA Certified Air Carrier and offer charter flights. LAX and Santa Monica are less than an hour flight away. Popular charter destinations include Temecula Wine Country and international flights to Baja, Mexico. We are experts at creating custom group charters to the destination of your choice. Do you have a helicopter tour brochure? You can download a PDF version of our brochure here. If you would like a physical copy of the brochure, please call (858) 505-5650, or email us. What is your helicopter tour cancellation policy? There is a 72-hour cancellation policy. Flights cancelled closer than 72 hours are subject to a $50 per seat cancellation fee. Why are there weight limits on helicopter flights? All helicopters are certificated for a specified maximum gross weight. It is unsafe to fly a helicopter over this weight limit, as it can adversely affect takeoff, climb, hovering, and landing performance. All flights and tours from Corporate Helicopters have strict passenger weight limits in order to fly safely. Passengers that exceed a certain helicopter’s weight limit can usually upgrade their tour or flight to a helicopter with a larger maximum gross weight capacity. This is at additional cost, as upgraded helicopters are always larger, heavier helicopters that require additional fuel and expense to operate. Guests weighing over 250 pounds are required to purchase an additional seat. This will ensure comfort for you and all of our guests on your flight. Can we hold our baby during a helicopter tour? The FAA (Federal Aviation Administration) allows children younger than 2 (24 months) to fly as a lap child. We encourage parents to consider bringing an aircraft approved car seat for their baby during their helicopter tour. This is not a requirement, but a recommendation. How do I see if a car seat is safe for a helicopter? You will know if your car seat is FAA approved if it has a sticker on it that says: This Restraint is Certified for Use in Motor Vehicles and Aircraft. Do babies require an extra ticket for a helicopter tour? However, we offer a discount (1/2 of a ticket price of the seat) for the baby if he/she is occupying a car seat. Do you offer discounted helicopter tour tickets for children? For children 24 months and younger, we offer a discount (1/2 of a ticket price of the seat) for the child if he/she is occupying a car seat. Children older than 24 months will need to pay a regular seat tour price for the helicopter tour. For our helicopter tour, do I need to bring ear protection for a baby? Yes, we encourage parents to bring ear protection, as our headsets will not fit small children properly. Can I make a marriage proposal during a helicopter tour? Quite a few marriage proposals have been made at Corporate Helicopters – you can see some of them here. We encourage you to purchase a private helicopter tour; we recommend our Romance in the Air helicopter tour. If you want to further customize this experience, contact us and we will help you plan the perfect proposal. 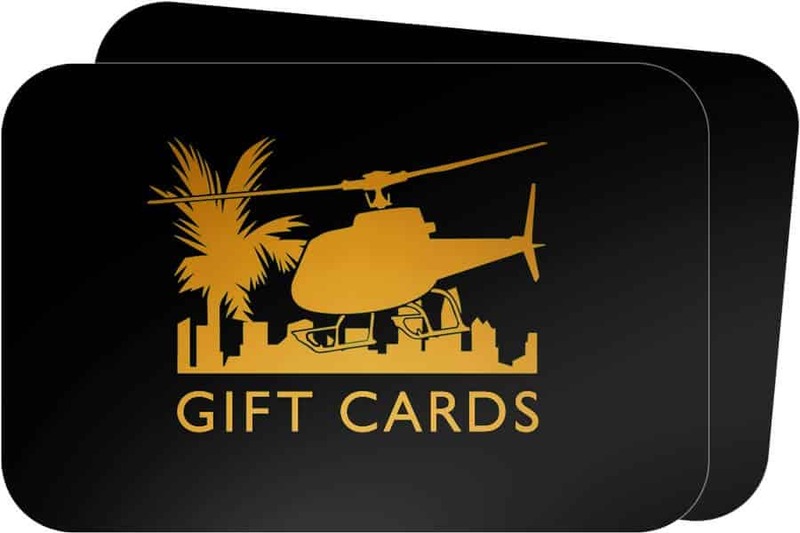 Do you offer discounts on helicopter tours? Yes, we offer a 10% military discount for each service member (must show military ID). We also have coupons available. Tour features include La Jolla Cove, Mission Bay, Sea World, San Diego Bay, Downtown San Diego, and more. Includes nearly everything in the Diego Delight. Also includes the Del Mar Racetrack, Ocean Beach Pier, Cabrillo Point, Coronado Island and the Coronado Bridge. Includes nearly everything in the Diego Delight and The Unforgettable. Also includes Miramar Air Station, Lake Hodges, Fairbanks Ranch, and Rancho Santa Fe.